This is the creamiest, cheesiest stovetop macaroni and cheese you’ll ever eat! 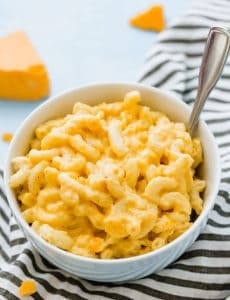 A big bowl of macaroni and cheese ranks right up there with a peanut butter and jelly sandwich for me when it comes to comfort food. 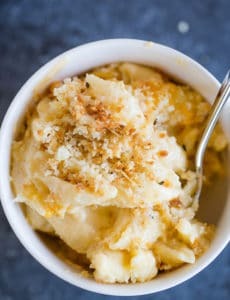 My go-to macaroni and cheese is my favorite baked version – I love the buttery crumb topping and crusted bits of macaroni and cheese around the edges! However, my father-in-law makes a seriously mean stovetop macaroni and cheese. 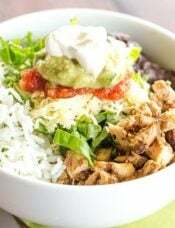 It’s one of my husband’s favorite foods and I cannot, for the life of me, replicate what he does. He’s given me his recipe countless times – he just uses butter, half and half, and cheese – but he says that he’ll add a little more cream or a little more cheese to get the consistency right. 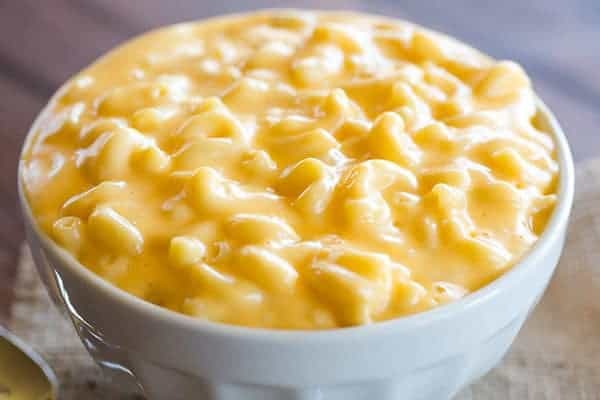 I just can’t seem to nail it, but was determined to find some type of creamy stovetop mac and cheese that I could make when my husband got hungry for it, as he doesn’t share my infatuation with baked macaroni and cheese. Not only did I find a creamy version, but I found what might be THE creamiest and cheesiest stovetop recipe EVER. Case closed. 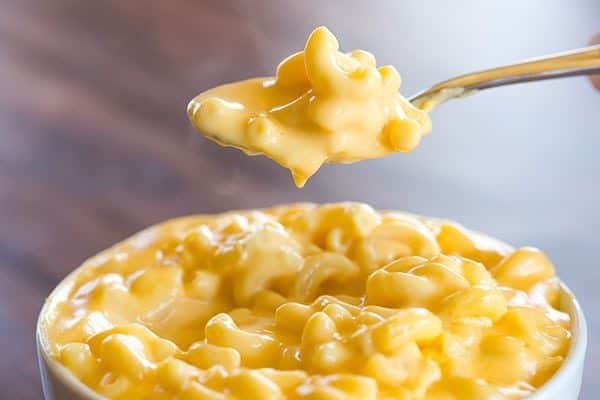 Watch How to Make Stovetop Macaroni and Cheese! I haven’t had much luck in the stovetop macaroni and cheese department, with many of the recipes I’ve tried turning out grainy or clumpy and just not very good. 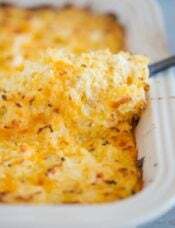 I also have an aversion to stovetop macaroni and cheese recipes that call for eggs… I’m sure they might be delicious, but it just doesn’t sound appetizing to me! This is an incredibly simple, basic cheese sauce made with butter, flour, milk and cheese, but the ratios result in one HECK of a cheese sauce. 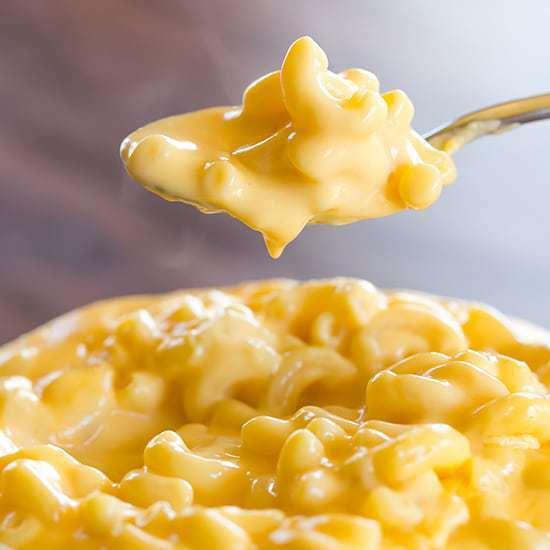 It’s super thick and cheesy, which basically equates to perfection when you’re talking about macaroni and cheese. Don’t be fooled by the fact that only 1 pound of elbow macaroni is used in this recipe… when I plopped the bowl down on the table for Sunday dinner, no one could believe that I only used a pound. Between the pasta and the sauce, this ends up making a TON! And the best part? It reheats like a DREAM! Some macaroni and cheese can dry upt or turn grainy when you reheat them, but not this one. It stays nice and creamy. It’s still not exactly like my father-in-law’s recipe, but I have absolutely found my go-to stovetop macaroni and cheese recipe! Hallelujah! 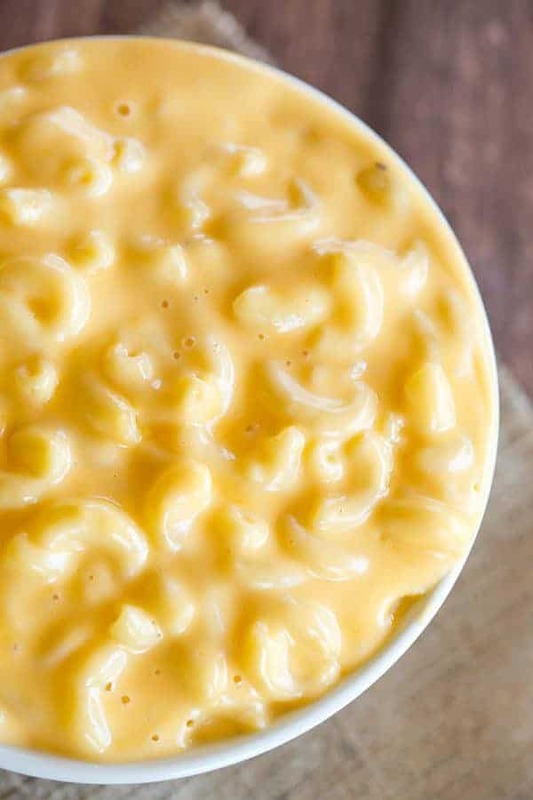 This is the creamiest, cheesiest stovetop macaroni and cheese you'll ever eat! Cook the pasta according to the instructions on the box, then drain; set aside. In a large Dutch oven or saucepan, melt the butter over medium heat. Add the flour and whisk to combine, then cook for 1 to 2 minutes, whisking constantly, until the mixture is a light golden brown color and beginning to emit a nutty smell. Reduce the heat to medium-low and slowly whisk in the milk until smooth. Simmer until slightly thickened, about 5 minutes, whisking occasionally. 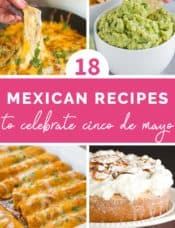 Add the cheese, a handful at a time, whisking well after each addition and not adding more until the previous handful is fully melted and incorporated. Season to taste with salt and pepper. 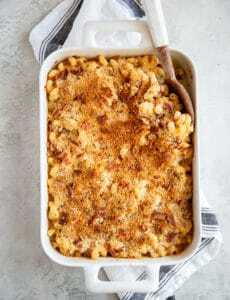 Add the drained pasta to the cheese sauce and stir to combine, breaking up any clumps of macaroni. Serve immediately. Leftovers can be stored in an airtight container in the refrigerator for up to 4 days. 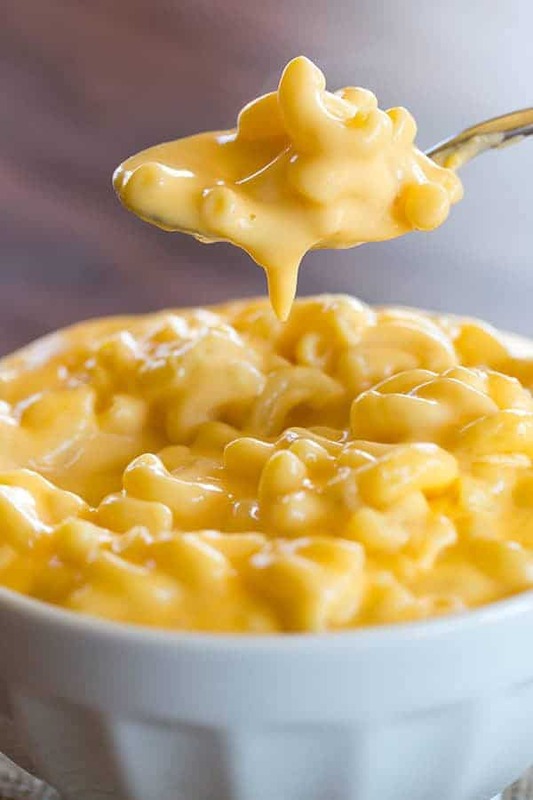 For those complaining that the mac n cheese sauce is too liquidly, make sure you’re giving roux+liquid enough time to cook/blend before adding cheese. The second time I made this I reduced sauce incredients by about 25% and it still came out plenty cheesy, but slightly less overwhelmingly so! Reduced milk to 2 cups and used 1 cup heavy cream. 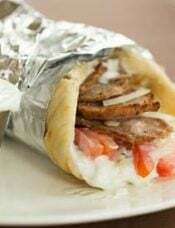 The grainy texture is from over cooking the white sauce. 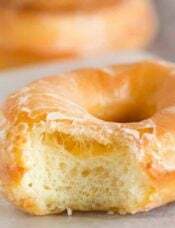 When cooked right it should have a creamy, velvety texture. Made it for Easter dinner and with the tweaking it came out perfect. I really enjoyed cooking this delicious mac and cheese, even though my house burnt down in the process. Made this tonight and it’s very grainy. Recipe is simple and love the cheesiness BUT the texture was really funky and actually kinda gross. I followed the instructions to a T. Not sure what gave it that texture but next time I’ll try a different recipe. Way too much cheese and gross gritty texture. I followed the instructions exactly and it does not taste good! Giving a star because it’s easy to follow and described well. Don’t recommend this. It isn’t even worth following again and costed over $10 make! Good flavor, and creaminess. But this is enough cheese sauce for 3 or 4 times the noodles. Mac & Cheese Soup!! I will not use this recipe again! My friend made this for the kids and every single kid ate seconds or thirds. I tried a bite and could see why! It was delicious!!! I got the recipe from her so I can recreate it because it’s one of the few meals that both my kids will eat. 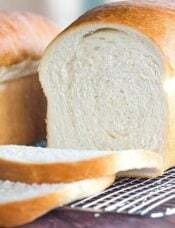 Thank you for the great and simple recipe! It came out liquid like soup. TOO LOOSE!